Majorities say that Medicare, Medicaid and Social Security need to be completely rebuilt or undergo major changes. However, even larger numbers say that other systems and policies are in need of major changes. Two-thirds (67%) say that immigration policy needs to be completely rebuilt (24%) or undergo major changes (43%). Nearly as many say the same about the nation’s educational system (66% completely rebuilt or major changes). And roughly six-in-ten think that the tax system (62%) and criminal justice system (60%) need at least major changes. 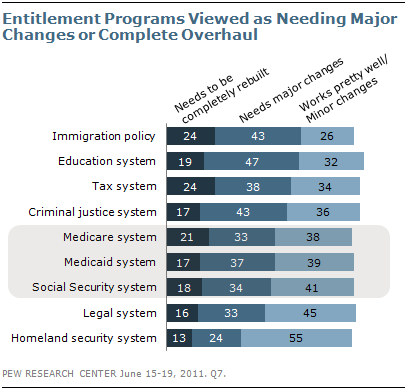 Among the entitlement programs, 54% say either that Medicare should be completely rebuilt (21%) or changed in a major way (33%). Comparable percentages say the same about the Medicaid system (54%) and Social Security system (52%). For each of the entitlement programs, the view that major change or a complete overhaul is needed is more widely held among Republicans than Democrats. About six-in-ten Republicans say each entitlement needs major changes or more, compared to about half of Democrats and about 55% of independents. While there are similar partisan gaps regarding changes to immigration policy (Republicans +17) and the criminal justice system (Democrats +12), there are narrower divisions when it comes to opinions about other policy areas. 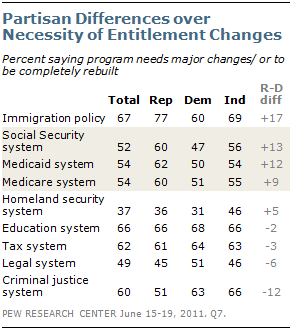 The public’s support for changing entitlement programs, while broad, has declined since February 2006. At that time, 70% of Americans said Medicare needed to be completely rebuilt or undergo major changes; today, 54% say the same. 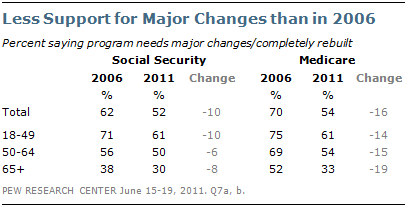 Support for major changes to Social Security has also declined, from 62% in 2006 to 52% today. Support for major changes to both Medicare and Social Security is significantly higher among those under 50 than it is among older Americans. About six-in-ten (61%) of those younger than 50 say Social Security requires major changes or a complete overhaul, compared with 50% of those 50 to 64 and just 30% of those 65 and older. Older Americans give both Social Security and Medicare higher marks for performance, with sizable majorities saying each does an excellent or good job serving the people they cover. 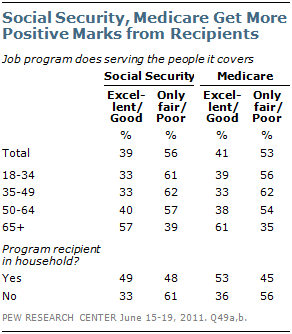 By contrast, most Americans under age 65 say the programs do only a fair job or a poor job serving their recipients. Those living in households receiving Medicare or Social Security benefits also are more likely to rate the quality of the services provided positively. About half of those with participants in the household rate Social Security (49%) and Medicare (53%) as excellent or good at serving the people it covers compared with about a third of those without program participants in their households. A similar gap is evident in views of Medicaid’s performance between recipient households and non-recipient households; 46% of those in households receiving Medicaid say it does an excellent or good job of serving the people it covers compared with 34% of those in households that do not receive Medicaid.